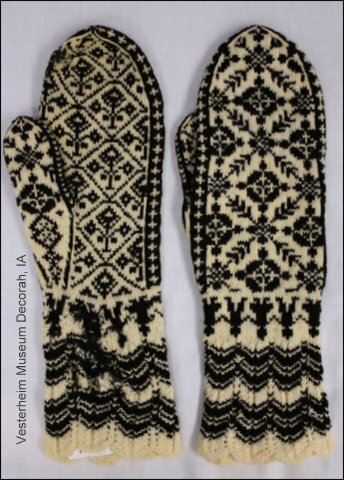 These mittens were in the collection of a first-generation American whose family originated in Selbu, an area of Norway famous for its mittens and gloves. Photo used with permission: Vesterheim Norwegian-American Musuem, Decorah, Iowa. Photo: Kate Larson. During the nineteenth century, Norway, like much of the world, was rapidly changing. In 1814, Norway declared its independence (officially dissolving the union with Sweden in 1905). By the 1830s, Norwegians were migrating to North America by the thousands in search of new opportunities. Many of these immigrants took small cultural mementos, like mittens, with them as they forged new and unknown paths. And some of those mittens that were carried across the sea by boat in wooden trunks eventually made their way into the collections of some wonderful museums, such as the Nordic Heritage Musuem in Seattle, Washington, and Vesterheim Norwegian-American Museum in Decorah, Iowa. I am fascinated by the immigrant experience—the process of interpreting a new culture, bringing some traditions forward and leaving others behind. Being particularly interested in material culture and textiles, I find collections of letters written by immigrants especially useful. In Solveig Zempel’s wonderful book, In Their Own Words: Letters from Norwegian Immigrants, you can read about Berta Serina Kingestad, a single mother who settled in Illinois. In an 1889 letter home to Norway, Berta asked her family to send her black wool which she could spin with white American wool on a borrowed spinning wheel. She hoped to knit new woolens for her baby, Sven. Berta’s letters were the inspiration for one of my recent knitting patterns, Mittens for Sven. This stranded baby mitten pattern is included in Baby Knits From Around the World, a collection of patterns edited by Kari Cornell and published by Creative Publishing International. Not only do you knit/spin and do all things fibery~well, but you also write nicely too!